Malta international Andre Schembri has registered yet another European goal for Apollon Limassol, as he scored the equalizer for his side in their away leg at Midtyjlland, in Denmark. Apollon qualified to the Europa League group stages, with Schembri set to become the second Maltese player to feature in the second best club competition in Europe, after Luke Dimech had played with AEK Larnaca back during the 2011/2012 campaign during which he also played against the likes of Schalke 04. Schembri has now netted four times in six Europa League outings since joining the Cyprus club from Boavista, with whom he spent the entire 2016/2017 campaign managing also to find the net against high-profile opponents like Benfica. The draws for the group stages will be released tomorrow at 1.00pm with Apollon having the opportunity to be drawn alongside teams of the calibre of Milan, Arsenal, Lazio and Everton. 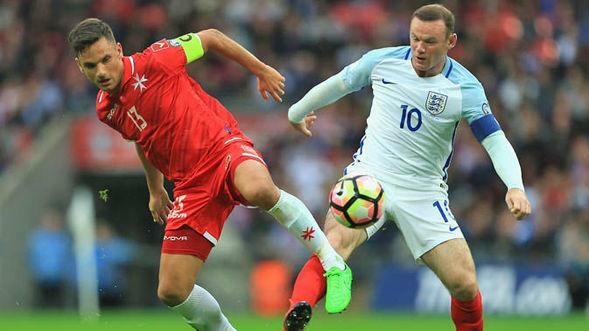 Malta's vice-captain Andre Schembri in action for Malta.